The USS Enterprise crew are tricked to a nebula in the furthest reaches of uncharted space, where they encounter a ruthless enemy who wants to tear the Federation apart. Director Justin Lin offers a fast paced third instalment with plenty of explosions and phaser laser shoot-outs. The action comes at full velocity especially after the Enterprise (is unnecessarily destroyed again). With the established cast of well loved characters Lin effortlessly helms what feels like a big budget Star Trek episode as they crash land on a planet. The effects are for the most part excellent, even if larger-than-life for epic set-up sake, especially in the opening attack and closing with the fleets star ship USS Franklin, zooming about a giant space station Starbase named Yorktown. 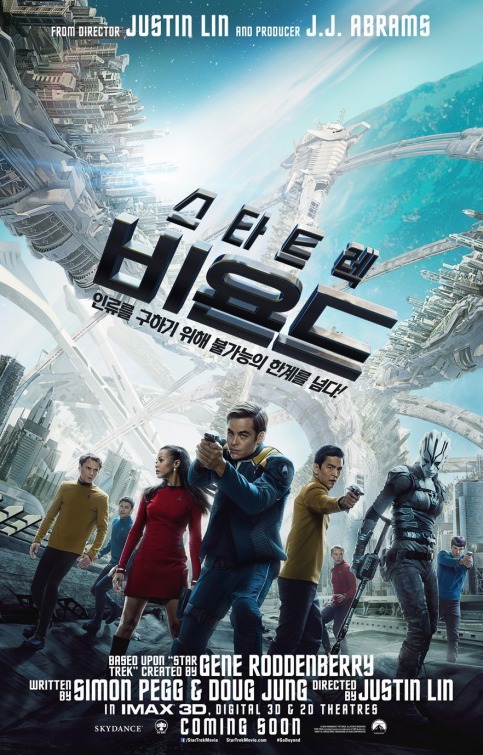 With Kirk regulars (Chris Pine), Spock, Bones (Karl Urban), Uhura (Zoe Saldana), Sulu (John Cho), Chekov (Anton Yelchin) and Scotty (Simon Pegg) the cast look more at ease, seemingly settled in their established roles and bring the well loved characters to life suitably. Echoing Wrath of Khan (1982) thankfully protagonist Idris Elba as Krall has a strong screen presence and is one of the better Star Trek baddies, for a moment in the closing it appears he’s going to become sickly honourable but appreciatively the writers were wise to avoid the trope. The new addition Sofia Boutella as Jaylah is excellent on all accounts, her character fits universe perfectly. There are flashy moments where she uses a holographic device similar to Total Recall (1990), Escape from L.A (1996) and Superman II (1980) etc, still, her character is well developed and Boutella breathtakingly executes the fight scenes (there is an opportunity for her to join the cast of characters with untimely death of the excellent actor Yelchin). Under Lin’s direction Elba and Boutella simply shine throughout. While it lacks any real Gene Roddenberry nebula exploration writers Simon Pegg and Doug Jung offer a straight forward story, the usual fitting Star Trek speak and relationship touches, echoing past films and series of the original crew, notably Bones’ interaction with Spock and Kirk. If anything it on the nose honours the original outings a little too much while not investing time in investigating the planets vegetation or natural life forms in place of a survival piece. It retains the series’ sci-fi roots, but skimps on the science and discovery, replacing it with blockbuster exploits. The staging, sets and costumes are perfect; Star Trek Beyond has some great visuals and it is wonderfully produced. Michael Giacchino’s great Star Trek theme finds it way throughout out and his additional scored music is more upbeat and less sterile, fittingly taking chances like Lin’s Beyond in whole. It’s interesting that they use the Franklin an old Starfleet ship, with Pegg and Jung’s transparent twist being reminiscent of H. G. Wells’ Morlock or the Cave (2005) to name a few. Touchingly there’s not only a tribute to Spock Prime (Leonard Nimoy) but to the whole original time-line crew where Zachary Quinto’s Spock comes across his older alternative time-line self’s belongings. The joint mission statement brings it casually to a Star Trek 50th Anniversary fan servicing close, enticing a fourth adventure. Overall, Beyond feels like an expensive and extended action packed episode, while not boldly going to places they haven’t been before, it’s an enjoyable comfortable stop.